I have a small confession to make. 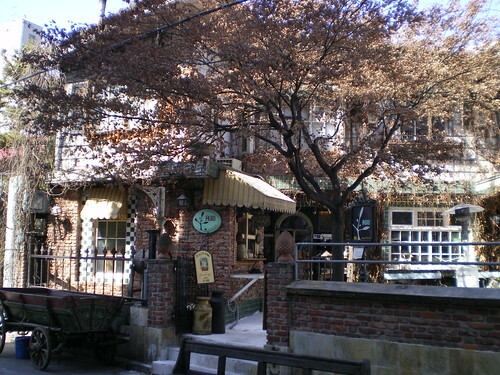 Despite spending over eight years in Seoul I have never really gotten to know Hongdae. I've been once or twice, sort of popping in and out to see friends or very, very occasionally go drinking. It's a little bit alien to me and for the first time, I found I had the opportunity to do a little exploring. After a wander round the area I feel guilty not to have spent more time here before and I'm determined to go back and explore all the nooks and crannies that Hongdae has to offer. 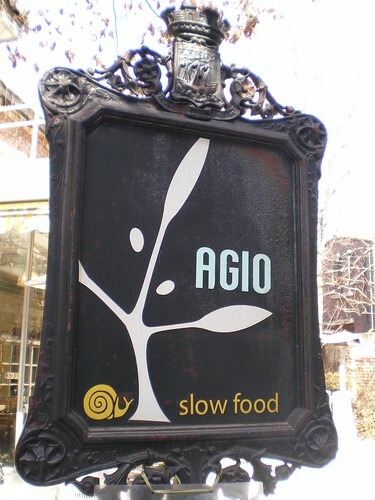 So after looking round I discovered this quaint little Italian restaurant called "Agio", the promise of "slow food" pulled me in and I was charmed by its romantic shoddiness. 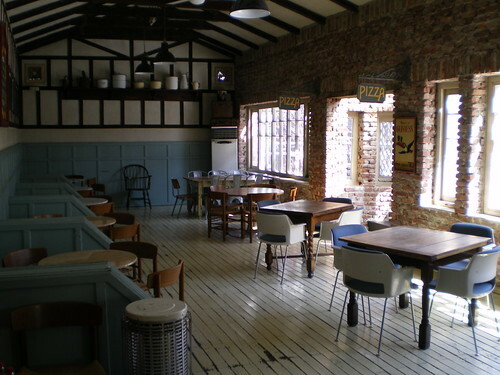 If restaurants were plants, this one would be an overgrown old hedge, messy and scratched, but still beautiful in its own way. The menu turned out to be completely 100% organic (the manager assured me that it was) and yet, while not a budget restaurant, the prices were still quite reasonable (9,000 to 15,000 won for a pasta). 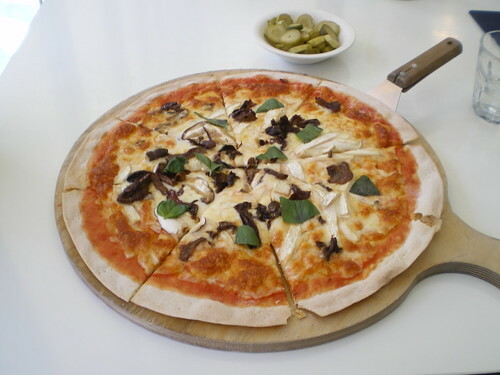 After much deliberation I decided to go for the "porcini & various mushroom pizza" (18,000 won plus tax) which promised wild porcini from Italy and fresh mozzarella cheese. 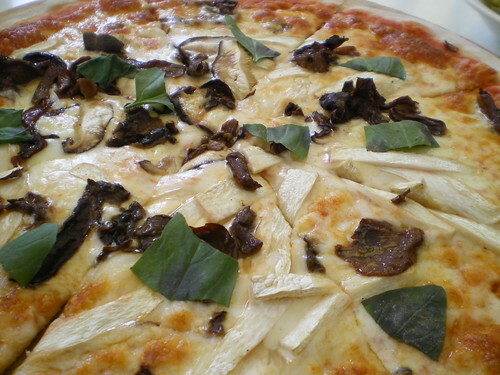 First impressions were good, a thin base, lots of mushrooms and shreds of basil, could it be a perfect pizza? Not quite, but they're very close. The base was crisp, but tasted a little bland and the cheese was nothing special. However, the mushrooms were delightful. Pine, oak and porcini mushrooms working together in harmony to create the most wonderful flavours and textures. A very respectable attempt at a traditional Italian pizza, that's worth a go if you are in the area. 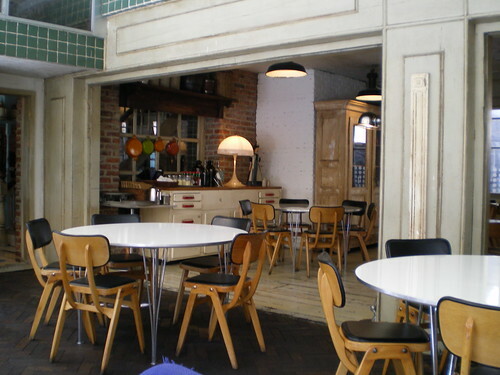 Looking at their business card, it seems that they have branches in Hongdae, Jung-dong and Insadong. To get to the Hongdae branch take exit 5 out of Hongik University station. Walk straight till you get to VIPS then take a left and turn right opposite the small tourist information office. Walk down the street filled with small fashion shops and tarot cafes, past the Lush soap store until you reach a clothes shop called: Togut University. Turn left here and Agio is on the left hand side about a minutes walk up the road. You can call them on 02 334 7311. On a slightly different note, while I've been enjoying organic porcini pizza, Zenkimchi has been brave enough to try the latest creation from Pizza School. 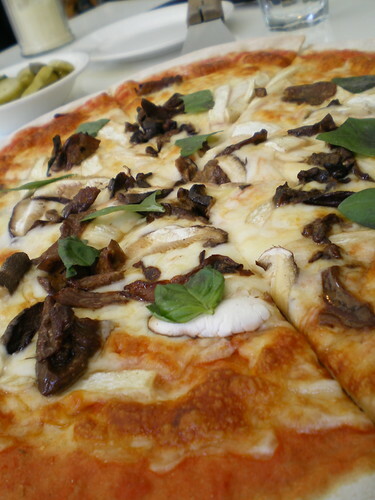 You can read all about his pasta topped pizza adventures here. My name is Andrew Dunkle and I wanted to quickly say that I enjoyed reading your blog, you really have a wonderful site setup here. I am contacting you in regards to a link exchange. I represent Reach To Teach, a recruiting company that provides job placement services for English teachers across Asia. I enjoyed your blog and I think that other people who are interested in living in Korea but what to learn more would like it too. Please come by and explore our site at www.reachtoteachrecruiting.com. I went to the Macaroni Market the other day. I was rather disappointed. The macaroni was half cooked and there was too much cheese and it was too rich to eat. The Pomme Frites were good though. And the cashier wouldn't tell me the price; she just put the bill in front of me and pointed (this is one of my pet peeves. Kraft Mac and Cheese would have been better.